Its amazing how this topic seems to be on the minds of so many people. I bet I get a few emails a month from folks asking for help designing and/or building a backyard bird photography studio. I have tried many different gadgets and setups for my backyard bird photography studio, both home-made and purchased. In fact I have tried as many setups as I have camera bags! Just like camera bags, different yard setups present different solutions and complications depending on weather and time of year. What I will attempt to do in this post is talk about and show you how I have generated the most consistent results in my backyard bird photography studio. I will give you one warning before you read this post. I follow the KISS method in my photography. KISS stands for Keep It Simple Stupid :-). If I had a dollar for every time someone asked me how many lights I setup in my backyard or how big or what kind of a tent I use for a blind, I would be rich. The simple answer is I don't use any of these things. I know, I know, some of you will say you have to use lights if you are going to stop the action of a hummingbirds wings or counteract the effects of the harsh mid day sun and this is true, in some applications. 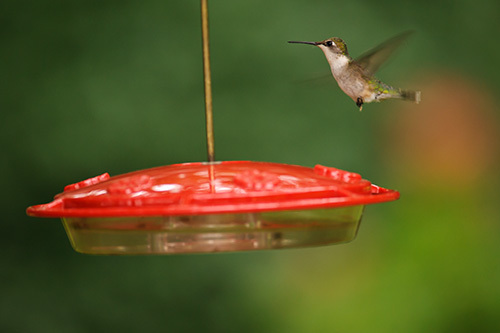 I will give you that using a flash when photographing hummingbirds is helpful but not required. As it relates to using a flash to help counteract the harsh midday sun my response is I don't photograph in the harsh midday sun. Have I used flash in the yard for special effects, yes. Do I use it often, no. So lets talk about the basics of backyard bird photography studio. What do you need for this to be successful? The first thing is you need to be able to control your background. There is nothing worse than a beautiful bird on a branch, with 20 other branches in the way or a sky scraper in the picture along with your subject! 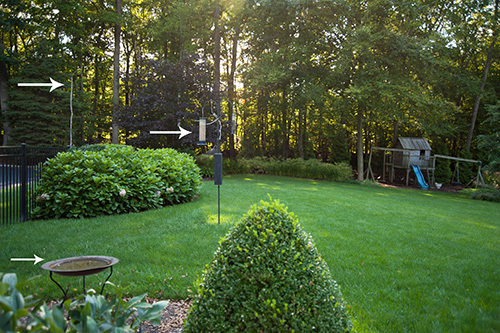 What you also need to consider before you select a location for your feeder is the angle of the sun and where you will be standing in relation to the sun and your feeder. Ideally, you want the sun to always be behind you (over one of your shoulders) so that you will be between the sun and the perches/branches you will be photographing. In the picture above you will notice 3 locations for birds to land, eat and drink. All 3 are highlighted by white arrows. I will show you closeup images below to help. 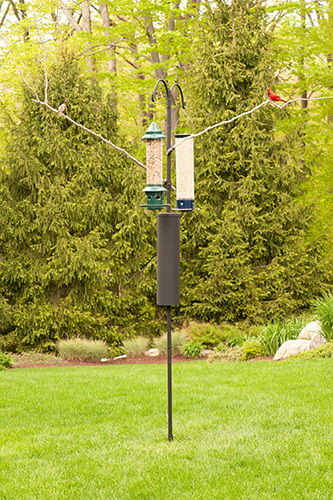 If you notice, I have placed the feeders, bird bath and large perch in locations where the birds can fly in and out to the woods easily. I have also made it easy for little song birds to hide in bushes and make their way to the feeders using the cover of the shrubs for safety. 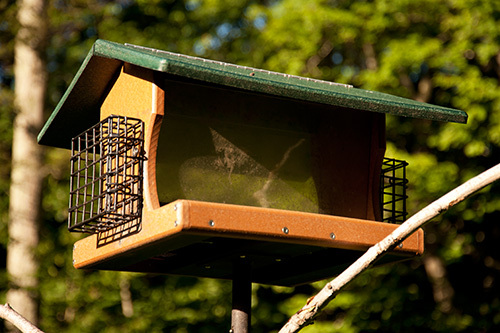 You should also notice that I do not place any of the feeders near windows in an attempt to limit window strikes. The feeders and stands I am currently using are made and sold by a company named Wild Birds Unlimited (WBU Link). I have found their products to be excellent and the store employees to be very helpful and friendly birders. I use the APS System (APS Link). Here is a view of the main feeder from the driveway where I usually shoot from. Notice the clean background behind the perches. 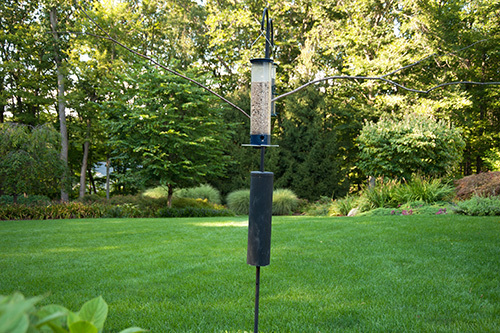 Providing water is an essential element to having happy birds at your feeders. In fact, water is often more difficult for them to find than food so if at all possible, try to provide this. I am actually considering burying a water feature in the ground nest spring for a different angle from which to photograph my birds! 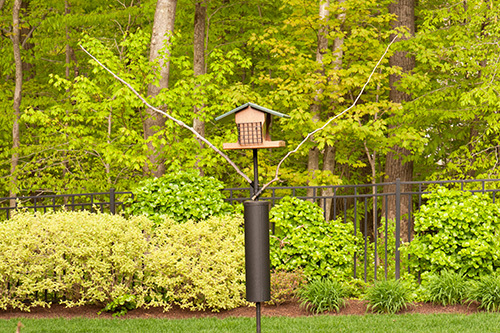 Hopefully this post gives you some ideas on how to layout your feeders and perches on your property in order to give you the best opportunities to photograph the birds in your backyard. Notice all my feeders have Squirrel and Raccoon baffles. So I thought that I would provide some examples of images you can take in the yard with and without special effects. 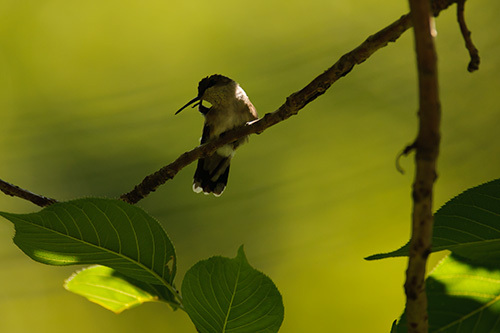 The two images of a Ruby Throated Hummingbird were both created without using flash. Nope, just plain old fashioned sunlight. Its just how you use that sunlight! The bottom image is taken using flash. The intent was to try and give the viewer the impression that the bird was actually photographed in front of a black background. It was actually photographed in front of a tree. Its amazing what you can do if you use your imagination when it comes to photography. Don't be afraid to experiment with your photography! 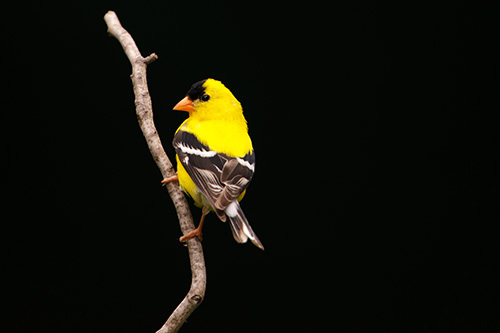 American Goldfinch photographed with flash to blacken background and make his colors pop! Nice post Vincent, and great photos. Nice to see how to set it up. NIcely done Vincent, looks like a sweet setup. Good stuff Vincent. I especially like your rigging for the natural branches. I've been meaning to try something like that. Thanks Laurence and Dan, have a great weekend. Thanks Robert, the clamps are very useful and not expensive at all. 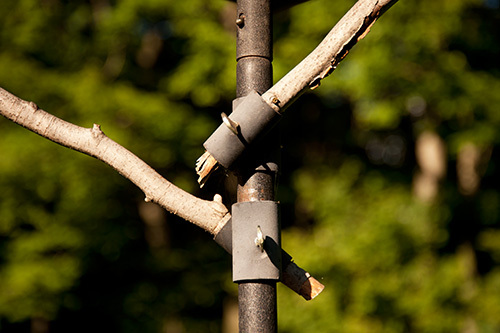 Their strength helps minimize vibration caused by the birds moving along the branch. That is the biggest issue with getting sharp images. Vincent, I enjoyed reading how you have set up your backyard. I really like the clamped branches. I think I will ask my handyman husband to rig something up for me. I can see why the birds visit your beautiful backyard. Wonderful post! The use of flash lights are not an absolute necessity! The WBU clips on the other hand are very interesting to get the branches at the right angle. I will have to see if I can find them in France or order a couple on the Net. An excellent idea, although I have 50 hectares to look for the right branch anyway! LOL!! Thanks for the trouble of writing about all this!